A combination of headlines caused a strong short squeeze on the Dow and lifted the overall market. Never short a dull market. With Thursday the lowest volume day of the year right behind Monday and Wednesday as the prior lowest, the market was really dull. On Thursday I recommended remaining in cash until we saw what was going to happen to the obviously cautious market. 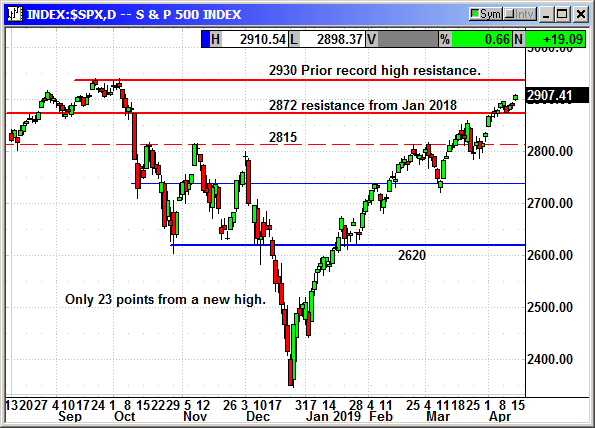 Friday's rally was the result of a short squeeze in Disney, JP Morgan, Boeing and Goldman that added 250 points to the Dow, and it was only up 269 points. Thanks guys! What are we going to see for an encore next week? Wednesday was not the right day to recommend FIVE. 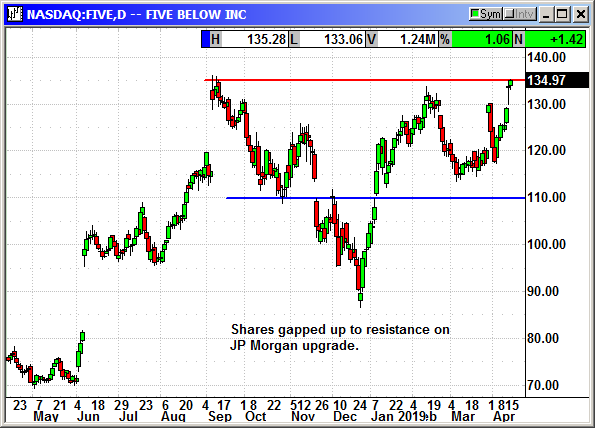 On Thursday morning JP Morgan upgraded the stock from hold to buy with a $150 price target and it gapped open $4 to fill the position at the high of the day. Fortunately, it continued to gain on Friday. Long May $135 call @ $6.00, see portfolio graphic for stop loss. No specific news. Only 68 cents from a new high. In November Intel announced a $15 billion share buyback program. Intel had $4.7 billion remaining under a prior authorization putting them just shy of $20 billion. This represents almost 10% of the outstanding shares. Six years ago, Intel had 6.5 billion shares outstanding. If they complete this buyback program, they will have just over 4 billion shares outstanding. Intel reported Q4 earnings of $1.28 that beat estimates for $1.22. However, revenue of $18.66 billion missed estimates for $19.02. Their biggest problem was guidance for Q1 of 87 cents on $16 billion in revenue. Analysts were expecting $1 on $17.29 billion. Intel is poised to benefit from a trade agreement with China. They currently get 24% of their revenue from China. With the advent of 5G, Intel is poised to be a leading player. They bill themselves as an "end to end" provider. The 5G revolution is not only going to replace nearly every piece of networking gear on the planet, every cellphone owner will be upgrading to a new 5G phone, many with an Intel modem. Remember the old commercials from the 2000's, "Intel Inside?" With Intel's new push into the internet of things (IoT), smartphone communications and self-driving vehicles, they really will be inside most electronic products. Intel is expected to grow revenue by 5% in 2019. That is better than the sector forecast for 2% growth. We have to reach out to the June option cycle to get a strike that comes after earnings and will keep the premiums inflated. We can buy time, but we do not have to use it. 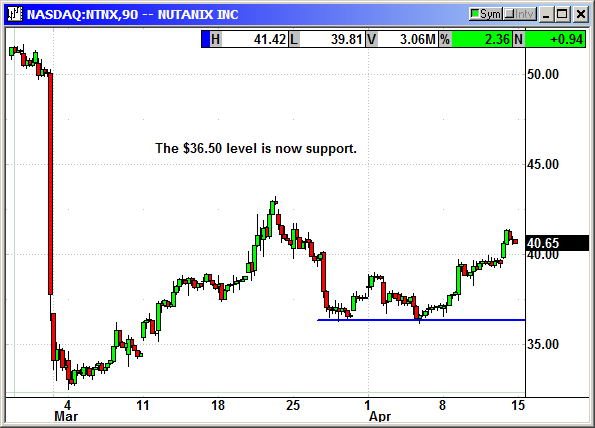 Long June $55 call @ $1.53, see portfolio graphic for stop loss. No specific news. Only 58 cents from a new high. 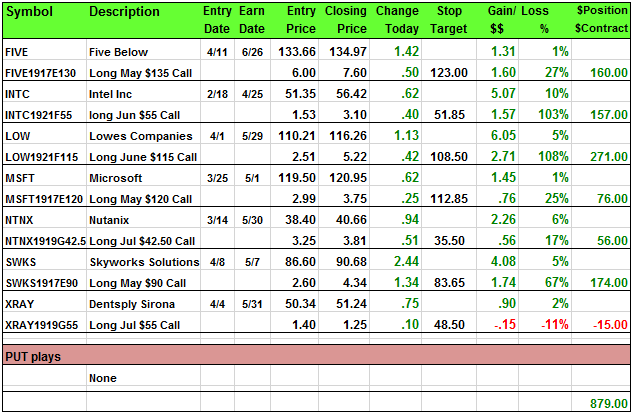 Long June $115 call @ $2.51, see portfolio graphic for stop loss. No specific news. New high at $121. Microsoft Corporation develops, licenses, and supports software, services, devices, and solutions worldwide. Its company's Productivity and Business Processes segment offers Office 365 commercial products and services, such as Office, Exchange, SharePoint, Skype for Business, Microsoft Teams, and related Client Access Licenses (CALs); Office 365 consumer services, including Skype, Outlook.com, and OneDrive; LinkedIn online professional network; and Dynamics business solutions comprising financial management, enterprise resource planning, customer relationship management, supply chain management, and analytics applications for small and medium businesses, large organizations, and divisions of enterprises. The company's Intelligent Cloud segment licenses server products and cloud services, such as SQL Server, Windows Server, Visual Studio, System Center, and related CALs, as well as Azure, a cloud platform; and enterprise services, including premier support and Microsoft consulting services to assist customers in developing, deploying, and managing Microsoft server and desktop solutions, as well as provides training and certification to developers and IT professionals. Its More Personal Computing segment offers Windows OEM, volume, and other non-volume licensing of the Windows operating system; patent licensing, Windows Internet of Things, and MSN display advertising; devices comprising Surface, PC accessories, and other intelligent devices; Xbox hardware and software and services; and Bing and Bing Ads search advertising. The company markets its products through original equipment manufacturers, distributors, and resellers; and online and Microsoft retail stores. Microsoft Corporation has collaboration with E.ON; strategic alliance with Nielsen Holdings plc and PAREXEL International Corp.; collaboration with NIIT Technologies Ltd.; and a strategic collaboration with Mastercard Incorporated. The company was founded in 1975 and is headquartered in Redmond, Washington. Company description from FinViz.com. Microsoft is closing in on one billion Windows 10 installations. This is a money printing machine. Their server software, Office 365, SQL Server, Azure cloud service, are all money printers. They are very close to killing the video game market and putting Gamestop out of business by releasing a download only video game console. They are going to put the Xbox in the cloud. This is called Project XCloud. The idea is to be able to play any game on any device at any time without a controller or software CD. This took some of the excitement out of the Google Stadia announcement. This is a simple recommendation. Shares closed at a new high on Thursday and pulled back to short-term support on Friday. 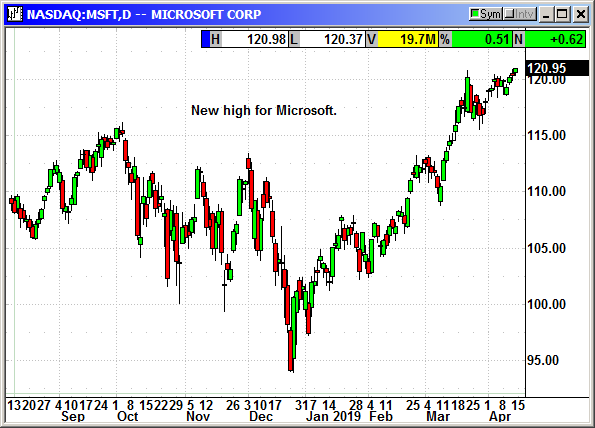 "IF" the market recovers, Microsoft should make new highs again. Long May $120 call @ $2.99, see portfolio graphic for stop loss. No specific news. After a false start the prior week, shares are moving up again. Nutanix, Inc., together with its subsidiaries, develops and provides an enterprise cloud platform in North America, Europe, the Asia Pacific, the Middle East, Latin America, and Africa. Its solution addresses a range of workloads, including enterprise applications, databases, virtual desktop infrastructure, unified communications, and big data analytics. The company offers Acropolis, an open platform comprising hyperconvergence, native virtualization, enterprise storage, virtual networking, and platform services; and Prism, an end-to-end consumer-grade management plane providing management and analytics across its software products and services. It also provides Nutanix Calm that offers native application orchestration, automation, and lifecycle management to its enterprise cloud platform. In addition, the company offers Beam, a multi-cloud optimization service; and Frame, a desktop-as-a-service. It serves customers in a range of industries, including automotive, consumer goods, education, energy, financial services, healthcare, manufacturing, media, public sector, retail, technology, and telecommunications, as well as service providers. The company was founded in 2009 and is headquartered in San Jose, California. Company description from FinViz.com. Nutanix shares were crushed on March 1st after they posted an adjusted loss of 14 cents. Analysts were expecting 25 cents, so this was a beat. Revenue of $335.4 million beat estimates for $331 million. However, billings rose from $355.9 million to $413.4 million. Analysts were expecting $416.5 million and not a big miss. The problem came from guidance. They guided for the current quarter for a loss of 60 cents on revenue of $290-$300 million and billings of $360-$370 million. Analysts were expecting 28 cents on revenue of $348 million and billings of $430.2 million. That was a major miss. The CFO said, "The guidance reflects the impact of inadequate marketing spending for pipeline generation and slower than expected sales hiring." "We took a critical look at these areas and have taken actions to address them." Shares fell $17 to $33 on the news. 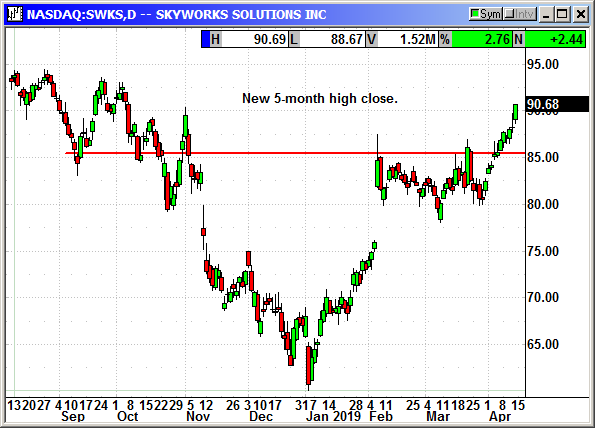 After a week of sideways consolidation shares have started to move higher. The CFO said they corrected the problem. That may not mean there will be a recovery in the current quarter but there will be a recovery. I am recommending we buy the dip. The first option cycle out of the 30-day premium depreciation window is July. We can buy time, but we do not have to use it. 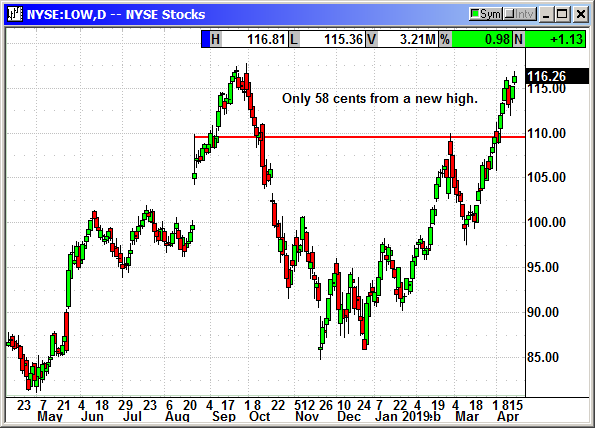 Long July $42.50 call @ $3.25, see portfolio graphic for stop loss. No specific news. 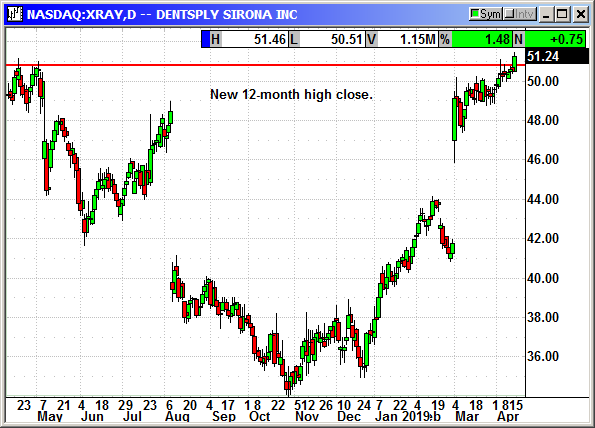 New 5-month high close. Long May $90 call @ $2.60, see portfolio graphic for stop loss. No specific news. New 12-month high close. 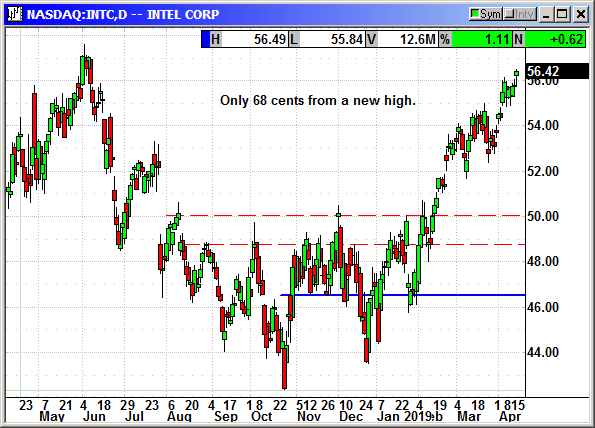 Long July $55 call @ $1.40, see portfolio graphic for stop loss.